A few weeks ago, I went into the dermatologist’s office for a skin check and got diagnosed with eczema. I was surprised. It felt like going into a coffee shop and leaving with a bag of kale. As a beauty editor, I’ve read about eczema; I’ve written about eczema; I’ve heard the word tossed around and bemoaned by various friends and co-workers for years. It just never occurred to me that I would be part of that club, even though the skin on my body has always been sensitive and prone to random bouts of itchiness. In the grand scheme of things, eczema at its mildest form is probably one of the least stigmatized and most common skin conditions. It affects 31.6 million people in the U.S. (around 10% of the entire population). But as someone who escaped childhood unscathed by many of the common maladies my peers struggled with (asthma, allergies, psoriasis, eczema), it was hard for me to grapple with the fact that I could have had this common skin condition for most of my life without even realizing it. It felt like embracing a new identity. I wasn’t just someone with sensitive skin on her body. I was someone with eczema! I proclaimed my newfound diagnosis to anyone within earshot for days. “How crazy is it that I have eczema? !” I would ask co-workers, friends, and one particularly chatty Uber driver (she got five stars). I marveled at the thought. It felt like I had been inducted into some sort of club—one that I didn’t exactly want to be initiated into but now that I was would embrace wholeheartedly. I wanted to let my eczema flag fly. But I’ll back up. A few weeks prior, I had developed a few small, coin-like, itchy spots on my left leg. I assumed they were mosquito bites. But instead of going away after a few days, they seemed to be getting worse and had formed into itchy scabs (ew). Still, I didn’t think much of them, because I’ve had small rashes like this in my past. I went into Goldenberg Dermatology—a chic Upper Eastside dermatology clinic run by a husband-and-wife derm duo—thinking I was going to get a skin-cancer check with a fancy new machine. I had never had one and was slightly concerned about the itchy spots on my legs. I was pretty sure I didn’t have skin cancer, but as someone who tends to stay up late spiraling over self-diagnosed maladies via WebMD, I thought it was time to get a professional opinion. Goldenberg peered at my spots closely. “Is it a staph infection?” I asked worriedly. This was one of the results that turned up when I googled “itchy inflamed skin” during my recent internet binge. “No, because if it was, you’d be in the hospital by now,” he said. Oh. “Is it skin cancer?” I asked again, more hesitantly. “No. I think you have eczema,” he said. What Goldenberg asked me if anyone in my family had eczema, to which I said I didn’t think so. Though, come to think of it, I wasn’t actually sure. He explained that sometimes people actually have it throughout their childhood but never get diagnosed because it’s not severe enough to go see a dermatologist. I suddenly flashed back to all the random rashes on my body I’d gotten as a child, seemingly out of the blue. It all made sense now. I had eczema! Back then, my mom blamed it on eating too much seafood and shellfish (which, in traditional Chinese medicine, contributes to excess heat in the body). Apparently, she wasn’t too far off. Goldenberg explained that eczema is an autoimmune disease caused by an overactive immune system and that it can be triggered by both external and internal factors, from stress to diet to environmental pollutants. He prescribed me a cortisone cream called Impoyz and told me to come back in two weeks. I was leaving on a trip to Korea a few days later and wasn’t able to get the cream in time before my trip. During that week, my eczema got exponentially worse. Anyone who’s ever dealt with an annoying skin condition knows how much it can wreak havoc on your emotions. (One time in high school I got a spider bite smack in the middle of my forehead. My self-esteem was not great for a long period of time.) The patches seemed to get bigger and even started oozing clear liquid (sorry for that lovely visual). They were itchy, inflamed, and painful. I was horrified that the skin on my body seemed to have a mind of its own and was revolting against me. I came home and immediately got the cortisone cream, and luckily, it worked almost instantly. It’s been a few weeks, and the spots have almost completely cleared up. But I’m still traumatized by how bad my eczema actually got and grappling with the newfound knowledge that I am an adult with eczema—and that I might have even had eczema this entire time without realizing it. 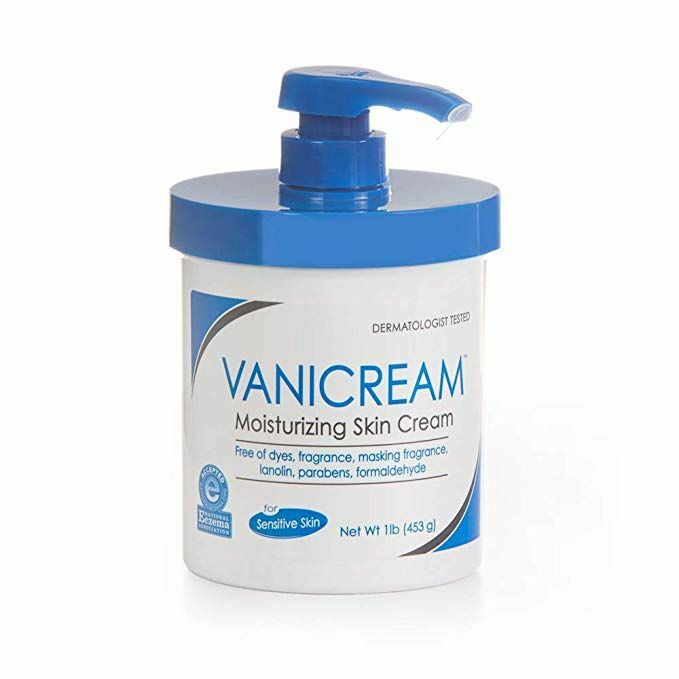 Even though they’re mostly healed, the areas around my spots are still incredibly dry, so I’ve been slathering on fragrance-free moisturizers every night, per Goldenberg’s suggestion. 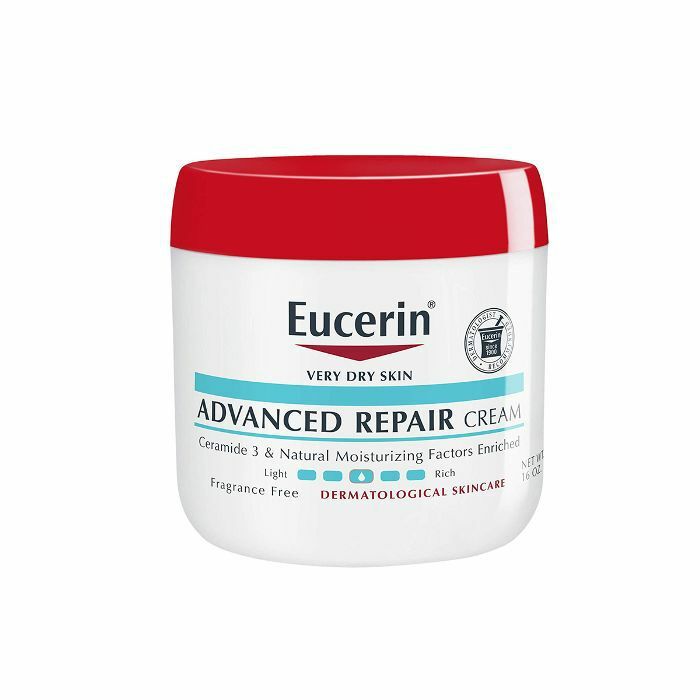 He recommended Vanicream, and I’ve also been using Eucerin Advanced Repair, which has helped immensely. I’ve also been a lot more conscious of the products I use and ensure they contain as little fragrance as possible—from body washes to laundry detergent. My fancy, scented body creams stand neglected on my nightstand. I look at them longingly but for now have decided the risk isn’t worth smelling like expensive roses. I’m trying to baby my skin more, as Goldenberg puts it, and so far, it seems to be working. I know another flare-up might be in my future, but at least this time I’m armed with the knowledge of what it is and how to deal with it—not to mention three tubes of cortisone cream. For anyone thinks they might have eczema, I’ve included the questions I bombarded Goldenberg with during my appointment and his answers below. Eczema is an umbrella term for a type of dermatitis, which means there’s inflammation in the skin. Eczema and something called atopic dermatitis are terms that are used interchangeably—99.9% of dermatologists will tell you it’s the same diagnosis. At its core, it’s a genetic predisposition for having dry or irritable skin. For a regular person, a minor skin irritation doesn’t produce any problem, but for a patient with eczema, it creates inflammation, and once that inflammation is there, it can persist. We don’t know what triggers it. It can be something internal, like stress, diet, medication. Or it can be something external, like environmental pollutants, fragrances in your skincare, being in a hotel and using a different soap. It can get the skin so inflamed that you make more dry, itchy patches than you would otherwise. And the body has a way of persisting with the inflammation. If you start getting inflammation, even if you take away the stimulus, the cause of the original inflammation can actually persist on its own. It’s an immune response. Once it gets turned on, it’s very hard to turn off. For most people, it’s dry, scaly, and itchy patches and bumps. For some people, it can just be dry skin that gets red and irritated. And for others, it’s little bumps, like hair follicles, getting inflamed. What is the difference between how eczema looks versus psoriasis? Psoriasis patches are very demarcated. They’re very neat and have very defined borders and usually have a silvery scale. Eczema is all over the place. Your skin is just undulations of normal and not normal skin, so it’s not so well defined. When do most people develop eczema? Most patients with eczema are kids. It can manifest as adults, but most commonly you have it from childhood. Can you get rid of eczema? If you’ve had eczema as a kid, it’s possible that when you become an adult, you can outgrow it. If you have it as an adult, it’ll stick with you. Like most chronic conditions, you’ll have a period of flare and a period of quiescence. We want to increase the time between the flares. So if normally you’d flare every month, if you can flare every three months, it’s already a huge improvement. How should someone deal with eczema? You want to use products that are gentle, mild, and not scented. Detergents and dryer sheets should be fragrance-free. I think cologne and perfume should be out. It’s basically like babying your skin. Things that you would never put on a baby, you shouldn’t put on your skin. I think diet plays a big role in eczema. I put patients on an anti-inflammatory diet sometimes. The alkaline diet can help. Probiotics help. You want to decrease the inflammation in your system from the inside. Then you have prescription creams that range from weak to strong. There are some tablets that help. The newest product for extreme cases is called Dupixent. It’s an injection you give to yourself. Someone can come in and half their body could be covered with eczema and in three months, they’re clear. It’s really life-changing. You get a new lease on life. Here's how to treat eczema on your face, according to dermatologists.